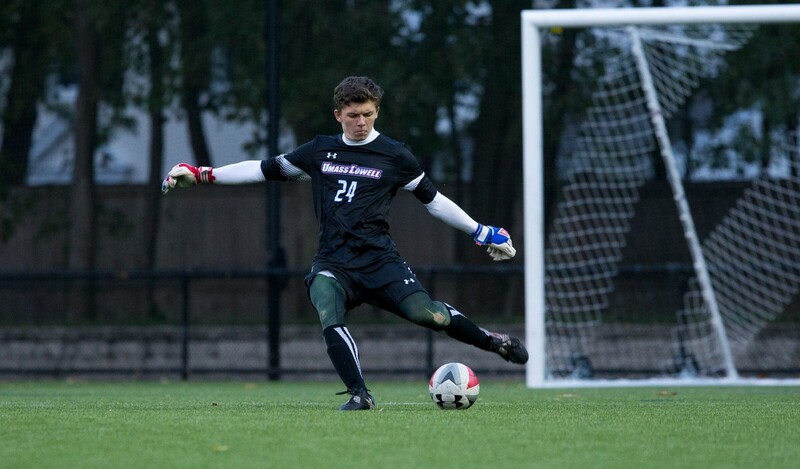 UMass Lowell junior goalkeeper Zachary Rowell is somewhat of a jack-of-all-trades. At St. John’s Prep, Rowell played soccer, indoor track and tennis. Sixteen of the career shutouts he accumulated on the soccer pitch in high school came when he was a senior. Off the field, Rowell earned high honors, and was recognized as an excellent history and religion student. He continued to play in college, first at Assumption College and then at UMass Lowell, recording 26 saves across four appearances at both schools. He also happens to be killer at music. Rowell has played in concert and jazz bands since he was single digits, and he has no plans of stopping anytime soon, despite how challenging it can be to balance Division I soccer, academics at UMass Lowell, and music. Rowell said that has been playing music since he was in elementary school when he picked up the alto saxophone. He has not put it down in the years since; Rowell moved up from the alto to the tenor and baritone saxophone, saying that he has even tried the soprano on a few occasions. Beyond that, Rowell has dabbled in clarinet, flute and the ukulele. “I picked up the ukulele a little over a year and a half ago on a whim and I’ve loved it, so that’s been a fun side project of mine to learn over the past few months,” said Rowell. Growing up around so much music and playing it himself, Rowell says that his taste is scattered across several genres. As long as a song has a good beat, Rowell will give it a chance. “Recently, I’ve been really into Quinn XCII, Skizzy Mars and Logic, but I can appreciate anything from rock and roll to rap to bluegrass and folk,” said Rowell. But when he is the one making the music, Rowell tends to veer towards jazz, especially when he is playing the saxophone. He names John Coltrane, Duke Ellington and Dizzy Gillespie as his particular inspirations as “quintessential masters of improvisation and jazz as a whole.” The ukulele is a different story – Rowell says that he prefers to cover pop and more relaxed songs. Playing soccer at the collegiate level makes it difficult for Rowell to practice but not impossible. Though it can be stressful to handle a Division I sport and the course load of a business management major, Rowell says that music has a calming effect on him. “I’ve always felt that music is something that allowed me to get through any adversity that came my way, so I’ve forced myself to make time for it. It’s always helped me to keep a level head and relax even if school or soccer isn’t going the way I wanted it to,” said Rowell. Despite the significant stressors of college, Rowell says that he has had time to perform. He performed in the jazz ensemble at Assumption, and he has played at the Manning School of Business Talent Show while at UMass Lowell. “I’d say I’ve been given quite a few opportunities to perform throughout my last few years, not as much as I would’ve liked, but at least there was some chances to have some fun with it,” said Rowell. Performing has given Rowell not only a chance to express himself but also an opportunity to connect with major figures in the field. In high school, Rowell performed “Blue Orpheus” at the University of New Hampshire with his jazz combo. Afterwards, he was approached by jazz trombonist Wycliffe Gordon. “He said that he thought that I interpreted the melody in such an interesting way and that my solo was easy to follow and seemed to be planned out, which was a huge compliment coming from such a renowned figure in the jazz community today,” said Rowell. After college, Rowell may well follow in Gordon’s footsteps. Rowell says he is eying a career in the music industry. “I’m not really sure to what capacity I would like to be involved, but I know for certain I’ll somehow get music into whatever I do in life after college,” said Rowell. For any curious listeners, Rowell says that unfortunately he does not have a SoundCloud – but he is not ruling one out completely. “I might start one up, so stay on the lookout,” said Rowell.